Blurb: Near Washington, D.C., there are two clandestine institutions: the world’s most unusual laboratory and a secret CIA training camp. Drawn to these sites by a murder, ex-Secret Service agent Sean King encounters a dark world of mathematicians, codes, and spies. His search for answers soon leads him to more shocking violence – and an autistic girl with an extraordinary genius. Now, only by working with his embattled partner, Michelle Maxwell, can he catch a killer … and solve a stunning mystery that threatens the entire nation. Review: This is the third book in the Sean King and Michelle Maxwell series. It had been many, many years since I had read the first two books and I had been nervous to pick back up with this series simply because of that issue. But I decided it was now or never for me to pick it up. And I’m really glad that I did pick this one up. It may have been a 530 page book, but I found myself reading 40 or 50 pages each and every time I picked it up. It sucked me in immediately and I really enjoyed it. I had very little trouble picking right back up with Sean and Michelle. The only thing I can criticize is that as a person not at all strong in math and/or science, I struggled to understand some of the quantum physic information involved in this book. 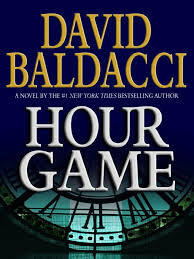 I know that Mr. Baldacci did what he could with that content, but it was still a little over my head at times. Luckily not enough to really have an impact on my overall feelings on this book, though. This book has definitely made me look forward into reading the others in the series … and hopefully sooner rather than later! A very good, strong installment. Recommended. Blurb: A woman is found murdered in the woods. It seems like a simple case but it soon escalates into a terrible nightmare. Someone is replicating the killing styles of the most infamous murderers of all time. No one knows this criminal’s motives … or who will die next. Two ex-Secret Service agents, Sean King and Michelle Maxwell, have been hired to defend a man’s innocence in a burglary involving an aristocratic, dysfunctional family. Then a series of secrets leads the partners right into the frantic hunt that is confounding even the FBI. Now King and Maxwell are playing the Hour Game, uncovering one horrifying revelation after another and putting their lives in danger. For the closer they get to the truth, the closer they get to the most shocking surprise of all. Review: Wow, talk about a crazy roller coaster ride! Yes, this book is nearly 600 pages long, but trust me when I tell you that the pages fly by! This book was full of twists and turns. I was constantly trying to figure out the “who-dun-it” part, and while I had it halfway figured out, there was one twist that I never saw coming … one that definitely threw me for a loop to be completely honest. I really liked the characters in this installment. Of course Sean and Michelle were enjoyable, but the supporting cast were something else! The Battle family … just, wow. I can’t help but laugh at just how dysfunctional that family really was. Mr. Baldacci sure did create a crazy family in that one! Ha! The storyline was interesting. There were multiple murders throughout the book and Sean and Michelle had to figure out which ones were connected to the others and which ones were separate. It definitely made for some thrilling moments. I really liked the copycat serial killers aspect, I thought that was an interesting way to take things. Overall I would definitely recommend this book. I must say that while I always recommend reading a series in order, I don’t think you would necessarily miss anything if you read this one before Split Second. Blurb: Michelle Maxwell has just wrecked her promising career at the Secret Service. Against her instincts, she let a presidential candidate out of her sight for the briefest moment and the man whose safety was her responsibility vanished into thin air. Sean King knows how the younger agent feels. Eight years earlier, the hard-charging Secret SErvice agent allowed his attention to be diverted for a split second. And the candidate he was protecting was gunned down before his eyes. Now Michelle and Sean are about to see their destinies converge. Review: This was a very good, fast-paced book. I thoroughly enjoyed it. I enjoyed all the characters. I think it will be interesting to see how this series progresses with Sean & Michelle partnering up for a private detective agency. I also wonder if there will be a romantic relationship between the two also, since there is a very obvious mutual attraction. I’m also curious to see if Joan will make a return in the future, she could definitely throw an interesting wrench in the proverbial mix!! Overall I really enjoyed this book and look forward to continuing the series in the future. Highly recommended! !